One of four varieties of Swiss Mountain Dog, the Bernese Mountain Dog is the only variety that possesses a long, silky coat. A hardy dog that thrives in cold weather, the “Berner?۪s” intelligence, strength and agility helped him perform the drafting and droving work in the mountainous region where he originated. Today, this versatile breed participates in conformation, obedience, carting, agility, tracking, herding and therapy work. Like the other Swiss breeds, they are tri-colored, with patches of black, rust and white. 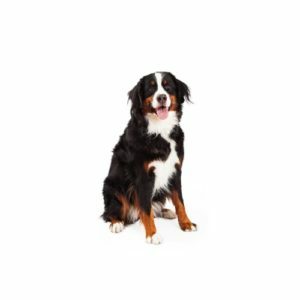 The Bernese Mountain Dog (Berner Sennenhund) originated in Switzerland and? ?is named for the Canton of Bern. Historically, Berners were used as general-purpose farm dogs. Their large, sturdy frames and calm, confident temperaments made them ideal for pulling carts to market, driving dairy cattle, watching the farm and acting as companions to farmers. Ranging in size from 23 to 27?_ inches tall at the shoulder.